Targets the price sensitive mass market. After marketing the Mahindra Centuro Rockstar in select states, the company has now made the entry level variant of its commuter available across the nation. The Centuro Rockstar is priced at INR 43,684 (ex-showroom Delhi). The base variant is roughly INR 3,000 cheaper than the N1 mid variant. While the N1 and O1 variants cater to the premium end of the commuter motorcycle segment, the Centuro Rockstar is positioned to cover a wide audience spectrum that is price sensitive. The visual difference comes from the bold 'Rockstar' branded decals with bright red, black and gold accents. The Mahindra Centuro Rockstar forgoes the anti-theft alarm, find me and guide me lamps. Speaking on the launch of the new variant, Mr. Viren Popli, Chief of Operations, Mahindra Two Wheeler Ltd. said, "Each Centuro now addresses a different consumer sub-segment in the large 100/ 110 cc category". In terms of equipment, the Centuro Rockstar retains alloy wheels, electric starter, LED pilot lamps and taillights, and the flip key, like in the higher variants but skimps on the anti-theft alarm, find me and guide me lamps. The instrument console is an analogue unit as against the Centuro O1's digital console. The powertrain continues to deliver 8.5 PS (8.38 bhp) and 8.5 Nm of torque. The transmission is a 4-speed unit with an all-up shift pattern. 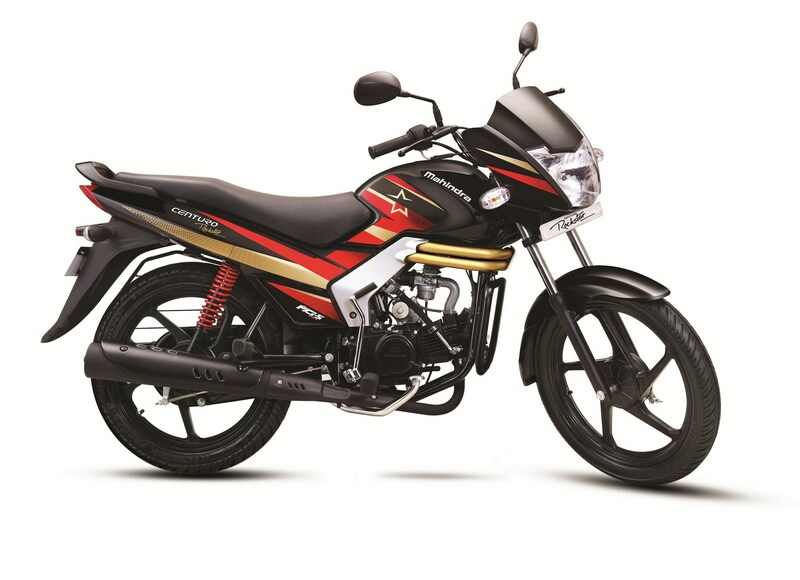 The Mahindra Centuro Rockstar is available in two color options - Blazing Black and Heavy Metallic Red. Mahindra will also launch a new top-end Centuro variant with a front disc brake in the coming months. More details available in the press release.